Codestone Cloud enables you to transform the way you provision and manage IT within your business. It enables you to migrate core IT services to the cloud and for them to be delivered as a highly agile managed service. Our expertise in cloud delivered infrastructure and applications has enabled us to create a comprehensive portfolio of services. All you have to do is select which elements are key for your organisation; we do the rest, allowing you to focus on your business. Codestone Cloud Compute is a flexible way to migrate your server and desktop infrastructure to the cloud and then consume this as a service (IaaS). Whether you are looking for a single virtual server or for us to deliver your Email, Database, Line of Business application or even IP telephony, we are able to provide the solution “as a service”. Cloud Gateway is a highly effective way to manage hybrid-IT environments (part on-premise / part cloud). We drop our appliance into your network providing you with a single-pane-of-glass for your on-premise and cloud-hosted systems. The Cloud Gateway enables us to provide a fully managed service across your IT environment from servers through to networks, peripherals and end user devices. Cloud Drive provides you with a secure and scalable “Enterprise Class” file storage solution in the cloud making documents and folders accessible to your people on any device from any location. 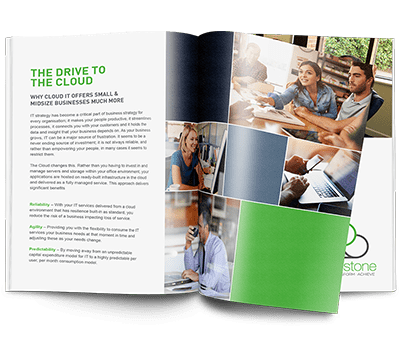 Unlike generic solutions like One Drive and Dropbox, the Codestone Cloud Drive is a customisable, managed storage solution with enterprise-grade security. Our Cloud Backup service provides you with the peace of mind that your corporate data is being reliably backed-up and stored off-site. Choose your own recovery point objective and recovery time objective to deliver only what your business needs to meet its compliance or commercial requirements. With Cloud Recovery we extend the business continuity service beyond backup to include replicating mission-critical business applications in the cloud so that if a failure occurs, it can be made instantly available and brought into service with just a few clicks or a phone call. Cloud App enables you to package up and deliver your windows desktop applications and access them from anywhere from our cloud. No application customisation or re-engineering is required. We simply host and manage your applications in the Codestone Cloud and deliver them to any user on any device with predictable per user, per month billing. Discover more about Codestone Cloud with our eBook outlining the key capabilities and value. Discover if Codestone Cloud is right for your business by chatting to one of our experts. Codestone Cloud enables you to make a transformational step in both the technology you provide your people and the way you consume and manage IT Services within your organisation. No longer do you have to try and predict what you will need in years to come and outlay vast amounts of capital for on-premise systems. Codestone Cloud enables you to align your IT to today’s needs, with the confidence that this can scale and adapt as your business evolves. Codestone helped create my vision of a ‘Martini Solution’. We wanted a solution that worked anytime, any place, anywhere on any device. There are many ways that SAP Business One from Codestone can positively impact your business; here are just a few. IT services delivered from a cloud environment that has resilience built-in as standard ensuring the highest level of availability of both applications and data. Providing you with the flexibility to consume the IT services your business needs at that moment in time and adjusting these as your needs change. By moving away from an unpredictable capital expenditure model for IT to a highly predictable per user, per month consumption model. The peace of mind that your IT infrastructure within our cloud can scale as your business grows user by user, server by server and gigabyte by gigabyte. What the cloud can do for your business with our eBook outlining the key capabilities and value. To discover more about how the cloud can transform your business, speak with one of our experts. At Codestone, we are not just IT experts; we truly understand how to deploy technology in a business to drive value, growth and unlock every person’s full potential. We work with you to understand your needs and roadmap what systems, applications and connectivity you need to fully address these needs. We then create your environment from the comprehensive portfolio of cloud services we offer and tailor a managed service that is right for you and your business.